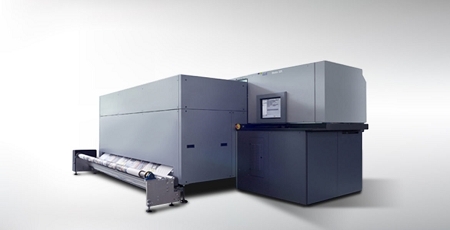 With the Rhotex 325, Durst introduces in the 3.2 meter printer class a dual purpose printing system that combines direct-to textile printing with dye sublimation transfer printing technology. Depending on the application and fabric, this printing system can alternate between paper transfer and direct printing on polyester-based materials in no time. This is possible, thanks to the new Durst WTS print head technology, which achieves an exceptionally high-quality print using water based dispersion inks for various printing materials, and reaches a printing speed of up to 390 m2/hour. The robustly built Rhotex 325 is equipped with an integrated hot air dryer, automated nozzle cleaning system, and additional features for 24/7 production. printer, with an extremely reduced maintenance time. printer even after long inactive periods. optimal media flatness during the printing process.